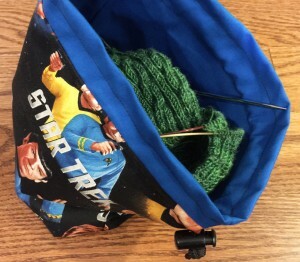 I found the ideal project to put into the Star Trek bag. It is a UFO, and like all UFO’s, there is a story attached. My daughter, Deborah, is (sometimes) a knitter, and she likes to knit socks. More accurately, she likes to knit a sock. One is enough, and unlike other people who forge ahead to knit the 2nd sock, she doesn’t bother. She might wear the socks as mismatched pair, or just set the lone sock aside to make another one that interests her. She is a Process knitter, enjoying the challenge of the knit. She really doesn’t care about wearing the actual pair of socks. This isn’t to say that she can’t finish things – she has made any number of ambitious, beautiful projects. But when she loses interest, she will turn away without a qualm. I envy her that ability, as projects haunt me until I finish them. Deb attended Sock Summit 2009, and fell in love with a pair of socks on display in the Market. The pattern is Treetop, by Heidi M. Scheppmann, and it was published in Knitty, summer 2009. Deb wanted to knit those socks. “Yeah, right”, I thought, but she REALLY wanted them. Really, desperately, truly wanted to have THOSE SOCKS. We bought the perfect yarn: Socks that Rock lightweight in color “Beryl”. 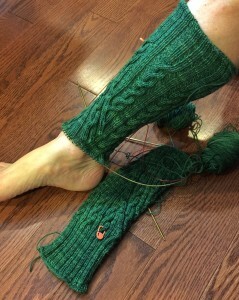 She decided that because this was a pair she wanted to finish and wear, she would knit them both at the same time. “Yeah, right”, I thought, but I bought her a copy of 2-at-a-time socks, by Melissa Morgan-Oakes, printed the Knitty pattern out for her, and waited to see if she would even get the yarn wound. She did, and carefully divided the first skein into 2 balls, one for each sock. I helped her with the cast-on, as she had never worked with 2 circular needles before, and she got to work. To my surprise, it wasn’t long before she was plowing through the (quite complex) chart. 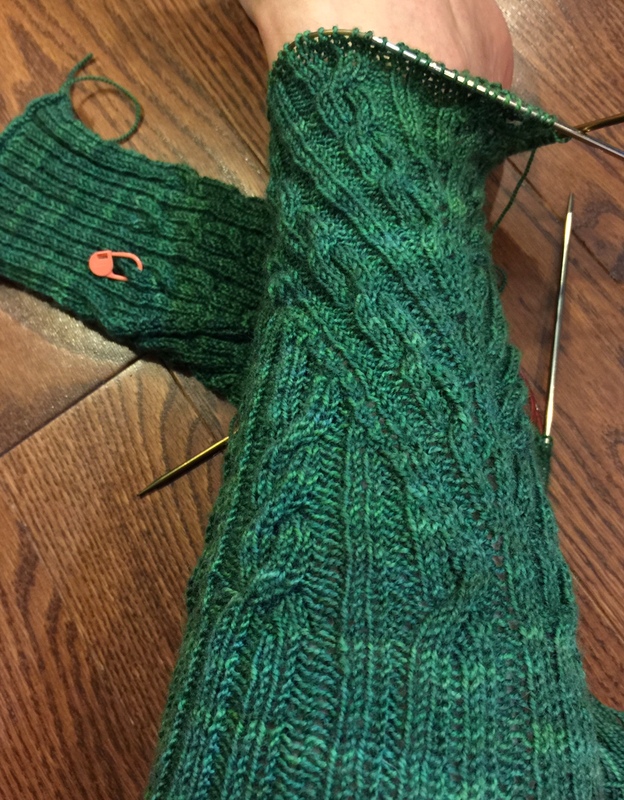 She worked steadily until she got to the point where the chart started to ease into ribbing, just before heel shaping….and quit. Just quit. She had fun with the complicated stuff, and the shaping, but when it got a bit boring, she was on to something else. That fall she left for college, and the unfinished socks were left behind in her room. Fast forward to a few months ago when Deb came home for a few days, courtesy of her first ever vacation from work. The attic was loaded with her stuff, and I needed to make some room, so I made a deal with her that we would spend a bit of time every day going through her stuff to see what we should ship to her current home, what could be cleared out, and what should stay in the attic. She was a super sport about it, and we got a lot of organizing done. A few significant finds were made, including her unfinished Treetop socks. She still loved them, but not enough to knit the boring heels and feet. She gave them to me, and I brought them downstairs to sit on my computer desk and haunt me with their UFO status. When casting about for a small project to put in my new, amazing Star Trek bag, by Jasmine Koski, I thought of the socks. Opening the ziplock bag they were stored in, I found both socks on the needles, and the chart print-out – with the rows Deb had worked crossed out, so that I knew where she had quit. She left the locking markers in the socks, marking the beginning of rounds. The pattern wasn’t in there, but the name of the pattern was on the bottom of the chart, so I could print it out again. Matching her gauge might be difficult, because I think I knit more tightly than she does. But a slightly tighter gauge is fine for ankle and foot. Her work is perfect, so far, and the yarn is sublime. There is an additional unwound skein, also, in case I need more. Basically, for a UFO, this is a dream come true. The complex stuff is done, I have extra yarn, chart and pattern, and Deb left clear signs of where she stopped knitting. This is a pretty good deal. And, it fits in the bag! Guess what I will be knitting this week?